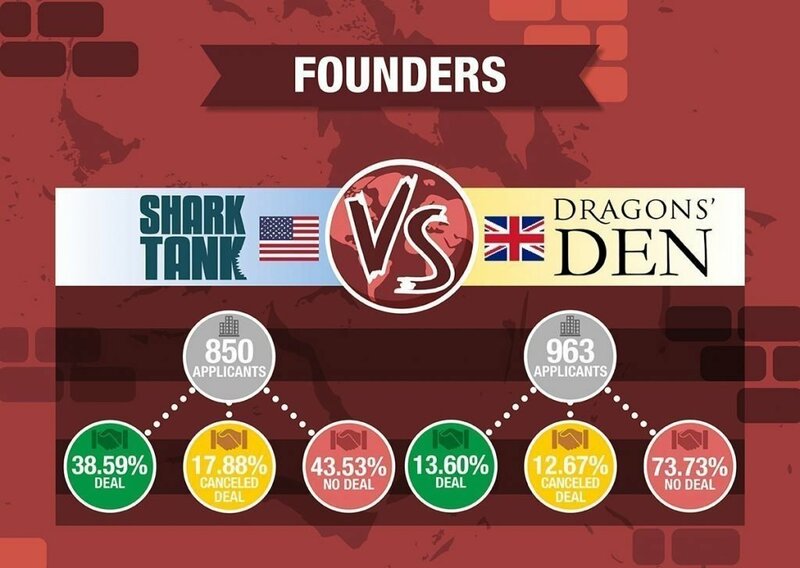 Shark Tank vs. Dragons’ Den: Do TV shows depict reality of CV markets? 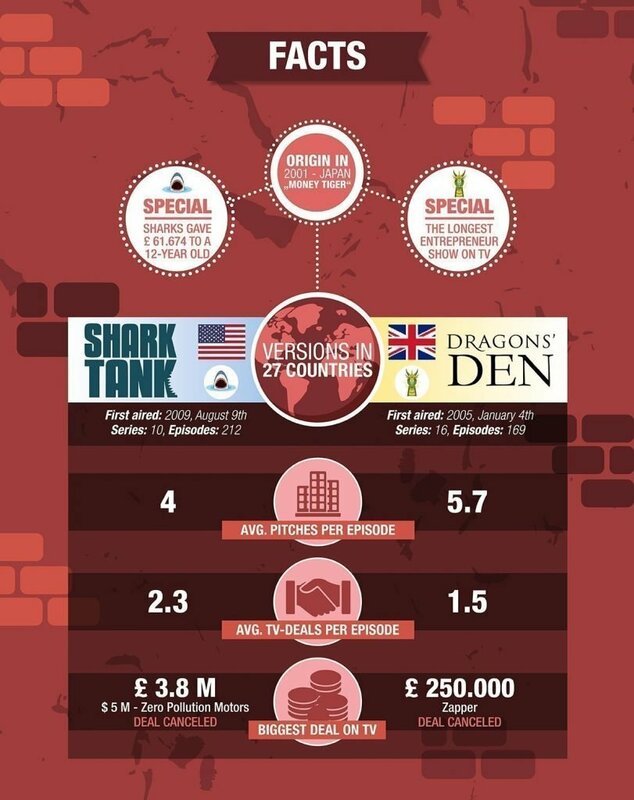 Shark Tank vs. Dragons’ Den: Do the TV shows depict reality of venture capital market in the US and the UK? Building your own business and collecting enough money to conquer the market was never as entertaining as nowadays when founders have the opportunity to present their vision in front of a group of multimillionaires and a huge TV audience. Based on the original format Tigers of Money, which aired in Japan between 2001 and 2005, the UK version Dragons’ Den started four years later. Now, in its 16th series, the British one is the longest running spin-off version with almost 1000 pitches on air. With all-time dragon Peter Jones, who became one of Britain’s most recognisable TV personalities and other picky investors Dragons’ Den is the complete opposite of the US version Shark Tank with its super-wealthy investors, like billionaire Mark Cuban. The concept of both TV-Shows is quite similar: Brave contestants present their ideas in front of the multimillionaires hoping to get a deal on air. What most of the viewers don’t know is that not all of the handshakes on TV lead to an investment afterwards. Plenty of deals fall through when the cameras stop rolling. Shark or dragon – who is more reliable and where do you get the most money and are those a realistic example of their venture capital markets? We compared two of the most popular entrepreneur shows and found out that they aren’t so similar at all! Emotional pitches, more than wealthy judges and a lot of show elements involved. On Shark Tank, the American dream is still alive and viewers get easily to the assumption that everything is possible. Watching the contestants take over the tank leaves you with the feeling that there isn’t any idea too stupid for investment. In an average shark tank episode, four contestants pitch in front of the sharks and over the half (2.3) of them walk away with a deal afterwards. There are few rejections. In our analysis, we found out that 51.78% of the candidates on air leave the abc show with a deal in their pocket. And the investments are on a large scale: More than 122 million dollars (93 million pounds) were invested from the beginning until the running 10th season. While in the US version millions are provided without hesitation the British dragons are quite picky with their money: From on average 5.7 contestants per episode, just 1.5 get a dragon’s handshake. Only 26.17% of all pitches end with an investment on TV. That’s less than half compared to the US When it comes to spending money the British multimillionaires are a bit stingy. In 16 series – a third more than Shark Tank – only £20 million were promised to founders. Less than a third of the US amount of money. While the average promised investment on Shark Tank is £195.7k the British investors provide only £81k. Though, a small investment doesn’t necessarily lead to a less successful business. In fact, the British version of the format seems to be more business oriented and even more realistic. While in the UK the biggest deal ever made on TV is £250,000, in the US deals of $500.000 (£382.204) are on schedule. While Dragons’ Den focuses on the deals, Shark Tank is more about the founders and their biographies. In the US, everything is made on a larger scale from deals to the entertainment section. Billionaire Mark Cuban from the US or UK tech tycoon Peter Jones – who will take you further? When it comes to a successful pitch it’s not all about the amount of money offered, rather than the experience and networking aspect that comes with a shark or dragon on board. We focused on the two main judges with the most episodes from both nations: shark Mark Cuban and dragon Peter Jones. 60-year-old Marc Cuban has a seat in the tank since season two. With a net worth of $3.9 billion, according to Forbes Cuban has a lot to offer. On Shark Tank, the owner of NBA’s basketball team Dallas Mavericks is a popular choice. When two sharks are interested in the same business they often go with him. No shark closed more deals than Cuban with 132 business agreements on air. Not all of the deals seen on TV work out afterwards but Cuban’s handshake on air is something to rely on. Only 11% of his deals fall through after the show. In 9 seasons of Shark Tank the billionaire offered entrepreneurs more than $28 million, no shark promised more money and 89% of the contestants who chose to work with him got the promised cash. Cuban is the king of going through with on-air deals. Working with the self-made billionaire has its price, the shark wants on average an equity of 20.82% for his business-related connections and skills. What Cuban is for Shark Tank, Peter Jones is for Dragons’ Den. The British entrepreneur is the last remaining original investor on the BBC Two show and filled his seat since the den first aired on 4 January 2005. In 16 seasons the tech tycoon made 83 agreements and sealed only 47 afterwards. With a quota of 56,63% fallen through deals, more than half of his promised investments were not sealed with a deal after the show and the contestants didn’t get a penny. According to our analysis, Peter Jones has shut down the most deals after negotiations. Between series 1 and 16, just £2.7m of the £4.7m pledged was ever invested by the main dragon. Regardlessly the 52-year-old is the show’s most prolific investor, offering funding to 83 of the 252 businesses. Working with Jones means usually giving away a quarter of your business. On average, the tycoon got 22.15% equity from the applicants. Dragon or shark – who’s deal is build to last? It’s no secret that plenty of the plans made on air between contestants and judges change or even fail when the cameras stop rolling. The reason is quite simple: What we see on these entrepreneurs’ shows isn’t as realistic as it might seem especially the first step of the negotiations (pitch and agreement) happens way too fast. The decision to invest in a business, without knowing the exact data and conditions after a few minutes pitching has to survive the negotiations. After the handshake on air, the real business is about to begin – if the partners agree with each other. Part of this is due diligence, an investigation of care where all costs, benefits, and risks of the company are revealed before the contract is signed. Certainly, not all of the entrepreneurs’ companies make it through this test whether on Shark Tank or Dragons’ Den, but there is a significant difference between those two shows. But it’s not always the investor who declines the deal afterwards, often the contestants make the decision not to seal the contract after the show. Plenty of entrepreneurs appear on the den primarily to gain publicity for their business. After their episode is aired, sales surge and an investment isn’t necessary anymore, so they pull out. “They get offered better deals in some cases or think they don’t need the dragons. But what they find when the publicity dies down is that they still need help running the business”, explained Meaden. Regardless of the reasons why the deals didn’t make it to an investment, the number of worked out deals is with 51,78% quite low. In fact, only half of the agreements on TV lead to a signed deal. How are things in the US version? Unsurprisingly, a handshake on Shark Tank doesn’t always lead to a sealed contract, too. But in our analysis, we came to the conclusion that a deal with a shark is more reliable than an agreement with a dragon. 850 entrepreneurs entered the tank since season one and 480 left with a deal. From those lucky ones which got a shark on board 328 founders passed the due diligence and fixed the deal with their famous business partner. In fact, 68.33% of the accepted deals on air worked out. Two-thirds of actually happening deals is a huge success, but are these numbers realistic compared to the market in the U.S. or is the ABC hit show telling us a fairytale too good to be true? Do Shark Tank and Dragons’ Den depict a realistic view of the venture capital markets? According to Andrew Cagnetta, the CEO of Transworld Business Advisors they do. The president of one of the largest brokerage companies in the US, said in an Interview with Forbes in 2016, that “approximately half of all deals fall through during the formal due diligence stage.” Which means that the negotiations with the sharks lead to one third more signed contracts than usual in the US. Compared to Dragons’ Den where 51.77% deals worked out, the ABC show seems less realistic than the UK version. But in relation to the conditions on the capital venture markets both are pointing in a similar direction towards the situation outside. The US venture capital (VC) market is one of the largest worldwide. The Americans like to invest. According to statistics from 2016 the value of VC spent in the US market was on average £159.71 per US inhabitant. That’s nine times the average amount of the UK, were only £17.39 per inhabitant flow back to the market. The gap between Shark Tank and Dragons’ Den investments is a bit smaller, though. The sharks invested on average six times more than the British judges. So the ratio between those entrepreneurs’ shows depicts a quite realistic picture of the states outside the TV. When it comes to investing money the mentalities couldn’t be more different. Americans like to take a little risk while British are more restrained with their savings. That affects the VC market, too. Like 26 other countries Germany has its own reality pitch show, called Die Höhle der Löwen (engl. The Lions’ Den). In four seasons of the VOX show 327 founders pitched in front of the jury and 150 got a deal promised on air. After the negotiations only 94 contestants signed a contract with the lions. 60% of the deals survived negotiations (see more in our study about The Lions’ Den). Compared to the UK’s 51.78% worked out deals the Shark Tank’s success rate with 68.33% seems to be something which is just suitable for the States. With their special mentality and their huge country Americans and their way of making business are quite unique. Here you find the whole graphic in high resolution.